The horse in the rear is one of the cast aluminum animals added in 1950. Note the differnce between the aluminum horse above and the wooden horse below. 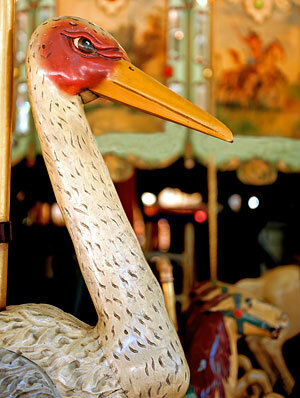 The Hershell-Spillman Merry-Go-Round was originally built in 1911 in New York by the Hershell-Spillman Company. It was first used in San Bernardino, California. From 1916 to 1927, the carousel was operated at Oceanside, California. Except for two years at Griffith Park in Los Angeles from 1935 to 1937, the merry-go-round remained in storage, until it was installed at its present location at the entrance of Lake Anza in Tilden Park in 1948. 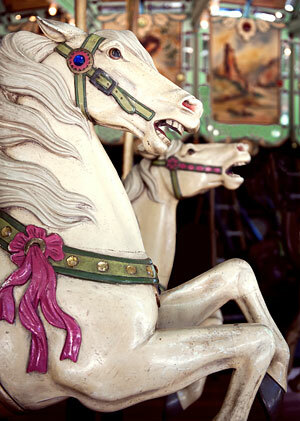 This classic sixteen section, three abreast carousel retains its thirty-nine original hand-carved poplarwood animals. The variety of types is exceptional. In addition to horses, there are thirteen other types of animals included in the menagerie: two giraffes, two roosters, two zebras, two frogs, a sea dragon, a tiger, a cat, a dog, a deer, a lion, a stork, a goat, and a pig. The frogs are unique examples of extremely rare carved wooded objects. 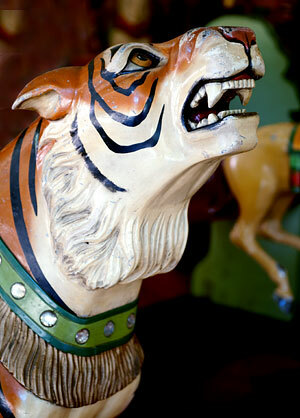 The carousel was altered in 1950 with the addition of a fourth row of cast aluminum animals. 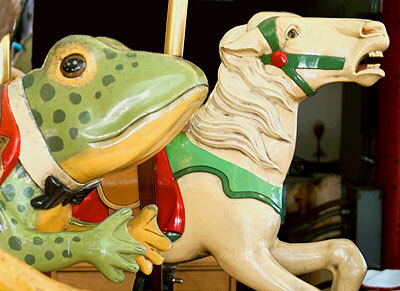 This carousel is a fine example of a particular genre of folk art. A work of art by any standards, this gay amusement device was a product of the golden age of carousels, a period between 1900 and the Great Depression before the onslaught of mass produced cast metal animals replaced the hand-crafted wooden ones. 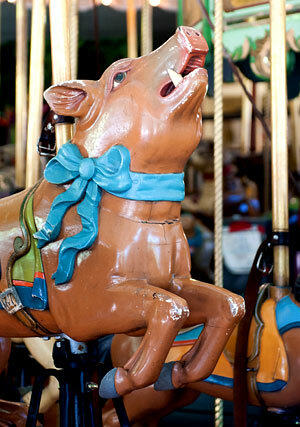 As this type of hand-craftsmanship died out during the Great Depression, the Tilden Park Carousel is one of approximately five classic carousels in California and sixteen in the western United States.